Do you take care of your own pool maintenance? Give us a call and let us know what you need. We offer a selection of proven and reasonably priced equipment and supplies. 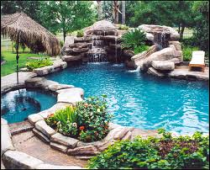 If you would prefer a professional to take care of your pool, just click here. We offer all common control systems for time-controlled heating, chemical cleaning, lighting, and flow systems. With just the push of a button, you can control everything in your pool and, if you so choose, even from your laptop or cell phone on the road.